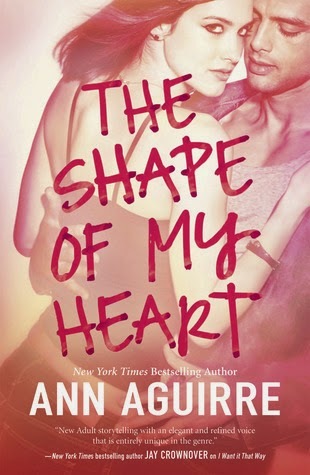 This week, my swoon is from The Shape of My Heart by Ann Aguirre! As he closed the distance between us, I feared my heart might fracture my rib cage. He wrapped his arms around me and titled his head, his face so close I couldn't focus on his features, so I shut my eyes. Like that was his cue, he kissed me. This time, it felt different, less hey, he's good at this, and more Oh, my God, Max is kissing me like he means it. Another beat, and I couldn't think at all. His lips were all heat and sweetness, turning over mine with compulsive yearning. Max tangled his hands in my hair and drew me closer as I teased his lower lip with my tongue. He responded with a graze of teeth, then he deepened the kiss, melting my bones with his intensity. We kissed forever, and I couldn't get close enough. He pulled me against him hard and fell back in the same motion so I landed on top of him. Read my review of The Shape of My Heart (book three)! Read my review of I Want It That Way (book one)! Read my review of As Long As You Love Me (book two)! Well that was definitely one swoon worthy kiss. Great pick, Alyssa. I really need to get started on this series. Thanks for stopping by my Swoon. Hope you too are having a great week. What an awesome swoon!! I cannot wait to read the book!! Whew! What a swoon!!!! I'm reading this in a few days! I am really excited now after that awesome kiss! Love that swoon! SOOO good! I am dying to get started on this series. It sounds so good and I'm not going to lie, I love the BSB titles haha. You'll love him even more, in this book!